Each year, between 140 and 160 officers are killed in the line of duty and their families and co-workers are left to cope with the tragic loss. Concerns of Police Survivors (C.O.P.S.) provides resources to help them rebuild their shattered lives. There is no membership fee to join C.O.P.S., for the price paid is already too high. C.O.P.S. was organized in 1984 with 110 individual members. Today over 30,000 families are active members. The group include spouses, children, parents, siblings, significant others, and affected co-workers of officers killed in the line of duty. C.O.P.S. is governed by a National Board of law enforcement survivors. All programs and services are administered by the National Office in Camdenton, Missouri. C.O.P.S. has over 50 Chapters nationwide that work with survivors at the grass-roots level. C.O.P.S. programs for survivors include the National Police Survivors’ Conference held each May during National Police Week, scholarships, peer-support at the national, state, and local levels, “C.O.P.S. Kids” counseling reimbursement program, the “C.O.P.S. Kids” Summer Camp, “C.O.P.S. Teens” Outward Bound experience for young adults, special retreats for spouses, parents, siblings, adult children, in-laws, and co-workers, trial and parole support, and other assistance programs. 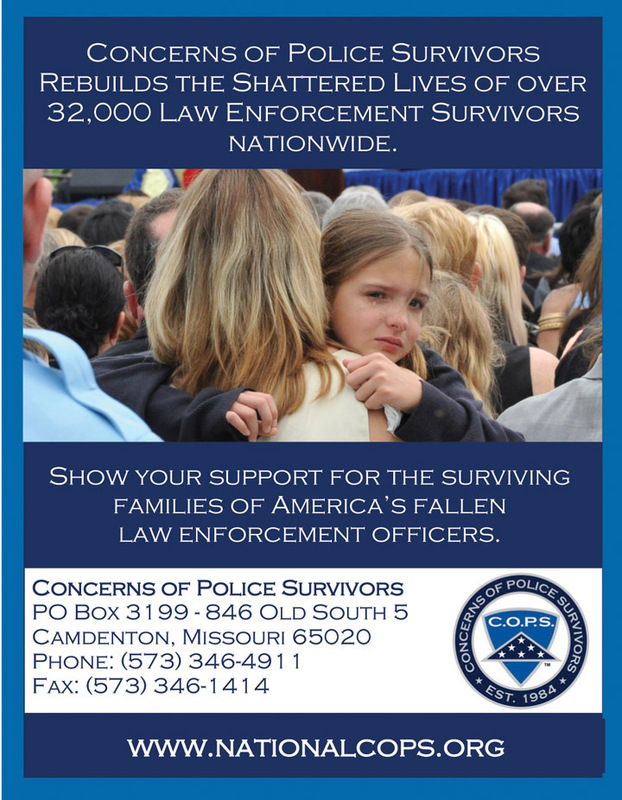 Law Enforcement agencies and organizations who support C.O.P.S. at the $250 level or above will be identified as “Partners in Law Enforcement” with C.O.P.S. and will be included on a “Partners” banner that will be displayed at National Police Week. 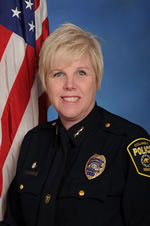 Deputy Chief Dianne Bernhard of the Columbia, MO, Police Department is the new executive director of C.O.P.S. Deputy Chief Dianne Bernhard of the Columbia, MO, Police Department retired after 21 years of service. She speaks proudly of her work as a patrol officer, creating a camp for kids, a Crisis Intervention Team, a leadership academy, and restructuring the agency and managing a $19 million dollar a year budget. She was also a member of the Columbia Police Mounted Team and came to know C.O.P.S. through the line-of-duty death of a co-worker, Officer Molly Bowden, in 2005. The C.O.P.S. organization is headquartered in Camdenton, MO. Suzie Sawyer, a 20-year Camdenton resident, founded C.O.P.S. in 1984 in the basement of her home in Maryland. C.O.P.S. moved to Camdenton in 1993 after her husband retired from the Prince George’s County, MD, Police Department. Sawyer, who retired from C.O.P.S. in 2011, returned last May to serve as Acting Executive Director.